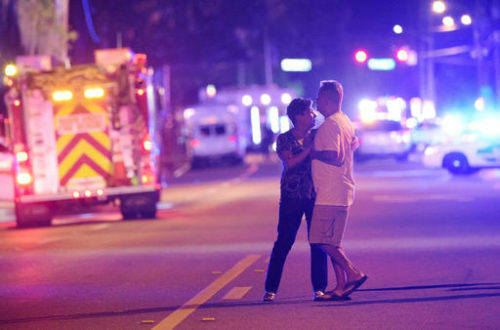 Two years ago today, Omar Mateen entered the Pulse nightclub in Orlando, Florida, with a legally purchased AR-15 assault rifle and killed 49 people and injured 53 more. The shooting did not lead to legislation to reduce gun violence. The will to even address the issue of gun violence – however ineffectively – would only come 612 days later, according to Pulse survivor Brandon Wolf. On the other hand, those 612 days saw bills that would have allowed guns on college campuses, government buildings, and even airports get hearings in the state legislature. Governor Rick Scott (R) even refused the simple gesture of wearing a rainbow ribbon to remember the victims of the Pulse shooting. On February 14, 2018, Nikolas Cruz entered Marjory Stoneman Douglas High School in Parkland, Florida, with an AR-15 assault weapon – the same kind that Mateen used at the Pulse. He killed 17 people and injured 17 more. The national outcry that followed the Parkland shooting was loud enough to be heard by Florida Republicans, and led to the passage of the Marjory Stoneman Douglas High School Public Safety Act less than a month after the shooting. The law was focused on arming teachers and making it more difficult for people with diagnosed mental health issues to buy guns, and it provided some funding for mental health care. It increased school security and created a three-day waiting period for all gun sales. This law isn’t much, and it contains a lot of measures that will probably be ineffective since they were included as a result of Republican talking points, not a genuine belief that they would work. But in the context of Florida’s GOP, it’s amazing that a gun control law passed at all, and a miracle that it passed so quickly after the shooting. It showed that even Florida Republicans realized that the public wanted them to do something about gun violence. Governor Scott, who has earned an A+ rating from the NRA – as well as the fawning praise of the gun lobby – signed the bill. That was unthinkable in the wake of the Pulse shooting. And he even wore a red ribbon to remember the victims of the Parkland shooting. Many of the measures included in the law address the particularities of the Parkland shooting – Cruz was 19-years-old, he had multiple diagnoses for mental health conditions, his shooting took place at a school, and school administrators tried to get him to undergo an involuntary psychiatric examination under the Baker Act. Mateen, on the other hand, was 29-years-old, had no record of mental health issues, and murdered people at a nightclub. The bill was clearly about Cruz, not Mateen. The issue is that some victims are more sympathetic than others. And Florida’s Republicans – as well as the national media – cared more about the mostly straight Parkland victims than the decidedly queer and more brown Pulse victims. “The majority of the Pulse victims, the 49 people who lost their lives at Pulse, they were mostly LGBTQ people of color. Didn’t their lives matter? Why wasn’t the debate about gun safety important enough then?” said state Representative Carlos Guillermo Smith (D). After the Pulse shooting, many people believed that things would be different. It was the most deadly mass shooting in America up to that point. But it doesn’t matter how many people die when the lives don’t really matter to people in power.